The Sidewalker Scooters line of kick scooters has been designed in Austria and manufactured in Taiwan to the highest standards. For the past 13 years we have been distributing and shipping them out of our Buffalo, NY warehouse to all over the US, Canada and beyond. 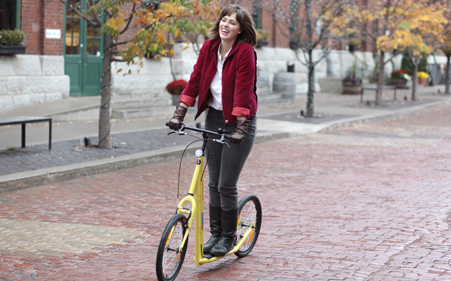 Bike riders can travel in a more upright position that is easier on the back. Scooter enthusiasts can now negotiate bumps and potholes and go wherever regular bikes can go. Looking like bicycles without seats , or scooters with bicycle wheels, it's hard to decide whether a bicycle-scooter is a scooter or a bike. In fact, people refer to them by various names such as scooter bikes, push bikes, push scooters, kick bikes, kick scooters, adult scooters, unmotorized scooters and so on. Scootering is a healthy, low impact activity that works on your cardio, strengthens the body& improves posture. Please one foot on the SIDEWALKER's platform and kick! Join the other foot and you're on a smoothest glide, feeling like nothing else! The Micro, Willy and City models offer a good mix of impact for fitness training, with more impact than cycling and less impact than running. With a low center of gravity and open architecture, they offer more freedom of movement than conventional bikes, and relief from back and seat pain. In the bicycle market, some would-be recumbent buyers and other comfort conscious riders are taking a close look at the bicycle-scooter models. The riding motion on a Sidewalker Scooters is somewhat similar to cross-country skiing. It utilizes the large muscle groups and is easier on the body than running. The supporting leg uses the anterior thigh muscles, while the kicking leg uses the posterior thigh and calf muscles. The riding motion also works the hips and buttocks. During an organized European race, a German team rode 342 miles in 24 hours, setting a world's record for bicycle-scooters. Another team road 970 miles through the Ural Mountains in Russia in just 10 days on snow and gravel covered roads. 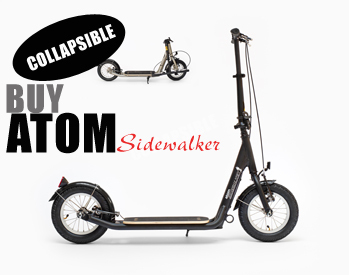 While most riders don't aspire to such lofty goals, the Sidewalker scooters are very durable and have proven themselves under tough riding conditions. For everyday trips around the neighborhood, most people cruise at 10 to 15 miles per hour. On the downhills, the Sidewalker Scooters go as fast as regular bikes. Some riders install a bike computer to track their mileage and speed. Kick Scooters are transportation made simple. There's no chain or oil to get you dirty, and no derailleur to adjust. They're easy to get on and off, and you can share a push scooter with family members, since there's no seat height to adjust. As the distinction between bicycles and scooters blurs with the introduction of new models, more and more people are rediscovering the joys of human-powered transportation. We're sure to see more of these machines on the road. The ultimate question may be whether people will call them bicycles, scooters or something totally different. Push scooter enthusiasts are used to hearing people say, "What's that?" or better yet, "Cool, where can I get one of those?" While sharing the basic design philosophy of combining good ergonomics, strong frame and pneumatic tires, each one of the 3 models offer something unique. The MICRO is the lightest and is foldable. The WILLY is agile and offers superb maneuverability. The CITY is the fastest and most stable ond offers "majestic" glide. 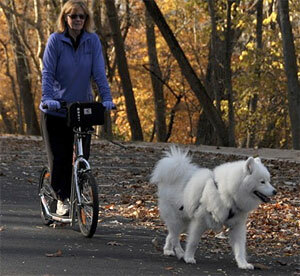 Bob Pace from Maryland, and his wife Colleen (pictured here with their dog), are having great fun dog scootering with a Willy Sidewalker. "Take one or two dogs that love to pull, properly hook them up to a Sidewalker kick Scooter and you have an amazing sport that allows you to have a ball and give your high energy dogs lots of exercise.Instead of a sled you have a scooter and no need for snow! This tends to be an urban sport on sidewalks and paved trails but fire road and mountain bike trails are fair game too. It is very important to have a properly fit harness for your dog, a gangline to connect dog and scooter and all the appropriate safety gear It�s a great way to spend quality time with your dog outdoors, give them (and you) exercise." "... I love it!!! ...The bigger wheels ... produce momentum which takes you further with less effort..."
I received my blue CITY Sidewalker model today, and was able to quickly assemble it and I love it!!! I also recently got a Kickbike G4 and I can tell you that your CITY model is much nicer. I like the bigger wheels because they produce momentum which takes you further with less effort. Also, the larger size and taller front end means less bending over. I love my new scooter. Thanks very much! Marci T. [Redding, CA] "...Love my 10-year-old MICRO!..." I bought a MICRO Sidewalkerfrom you about 10 years ago! I still love it! "...Great exercise, fun to operate..."
I love the CITY Sidewalker. Great exercise, fun to operate. I want to use it every day! Slower than a bicycle, but a better workout. We got the scooters ......love them! We took them on a long ride yesterday ... [a] good workout too! Got the scooter professionally assembled and attached the pulling system myself. We took it out for our first test run on Sunday. It only took my dog about 3 strides to get the hang of it, and we were off like a shot. It works perfectly. The design is excellent. My dog LOVED it. It's everything I have been wanting in a combination of wheels + dog but could never find. Thank you so much! 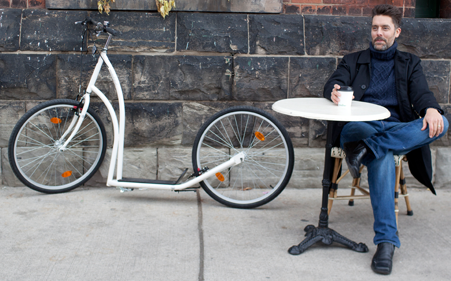 "...Very, very convenient to ride in the city..."
I am so so pleased with the MICRO Sidewalker. I immediately enjoyed riding it, although it took me a few weeks to use it daily. It is much more tiring that biking but I have no time for exercise and with 30 minutes a day total riding the Micro I am now in very good shape and it's lots of fun. I have been using since beginning of July daily to drop my children (6 and 4 years) at school/camp (one at a time) and continue my way to work. I am taking it daily in the train and after the train I am riding for 15 minutes to go to work. During these summer days I really enjoyed riding the Micro sidewalker. It is very well-designed for city use; compact, very sturdy, very easy to fold and has a very cool look. I love the colorful bell. It is a lot of fun and very very convenient to ride in the city. I do not feel a shock when I am riding over holes or edges of sidewalk. I love the WILLY Sidewalker! "...Very happy with my WILLY Sidewalker.."
If you ever need a testimonial for your website I'll be happy to oblige. I am very happy with my WILLY Sidewalker, it has given me several years of good service.